The Indianapolis Colts beat their AFC South rivals, the Houston Texas 21-7 in Saturday’s playoff game. Andrew Luck led his team and it felt like he controlled the entire game, throwing for 222 yards and two touchdowns. While those numbers don’t scream elite performance, his command of the field did. Whether it was avoiding a sack or converting on a third down, Luck made things happen. In fact, he wasn’t sacked a single time in the game. Luck has come a long way since missing the entire 2017 season and significant time in 2016. It didn’t always look this way. The Colts had a 1-5 record after the first six games of the season but went 9-1 after that to secure a Wild Card spot. Luck has looked like his old self in this time and is almost assured the NFL Comeback Player of the Year award. 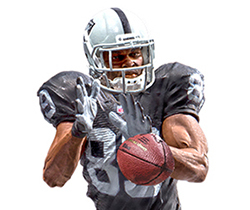 Next, he leads his team to Kansas City to take on potential MVP Patrick Mahomes. 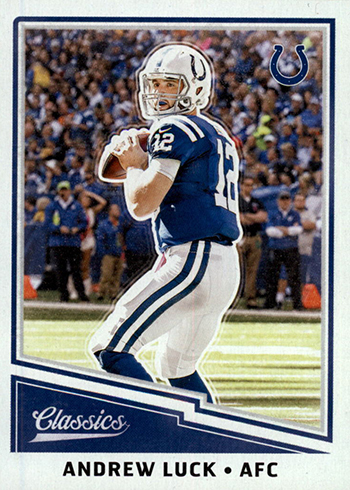 Currently, there are nearly 7,000 Andrew Luck cards in the Beckett Online Price Guide including almost 1,800 autographs. 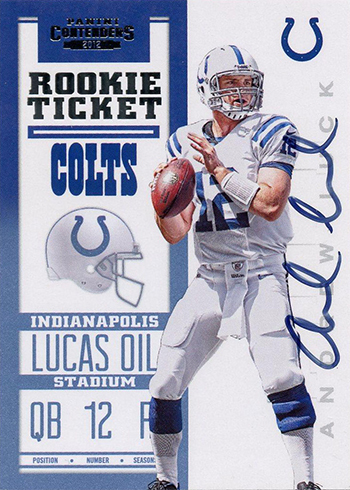 Ever since his rookie year, Andrew Luck’s cards have sold for top dollar and was consistently on the top of the Beckett Hot List. 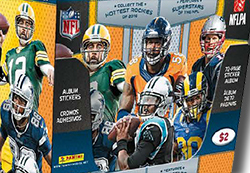 His 2012 Panini Contenders autograph card is one of the best cards of all-time (at least in my opinion). Values on Luck’s cards have softened a little bit in the last year but that was to be expected when he missed an entire season. Starting the season 1-5 didn’t help much either but his values are starting to climb back. And that should only continue if he can lead the Colts to the AFC Championship game or even the Super Bowl.